story given while under sodium amytal, he states it did not differ in content from the first telling. As has been previously mentioned in this section, Tommy has subsequently made revelatory amendments, alterations, and outright contradictions to this original story during the course of two pivotal interviews with Sutton Associates investigators--one on October 7, 1994, [footnote 1] and one February 6, 1995. In addition, there are significant discrepancies between his stories on these two subsequent dates. In order to examine the significance of these amendments, alterations, and contradictions, we should first re-familiarize ourselves with the current general information regarding Tommy's actions on the night in question, The following excerpts are taken from the time-line, which incorporates all the pertinent data up to, but not including, Sutton Associates February 6, 1995 interview with Tommy Skakel. OCTOBER 30, 1975 The following segments provide a general context for information regarding Tommy's activities on the night Martha Moxley's murder. 9:15 p.m.--According to Tommy Skakel, from his interview on 10/7/94, [footnote 1] with Sutton Associates, at approximately this time he left the sun porch area and went outside to the side of the house to retrieve a tape cassette from his parents car. Inside the car, Tommy encountered Martha Moxley, his brother Michael, Helen Ix and Jeffrey [Geoffrey] Byrne, who were all listening to music. Soon after, he and Martha would move to the area around the shed, off the driveway, and begin "making out." 9:30 pm to 9:35 pm--According to Tommy Skakel, from his interview on 10/7/94 [footnote 1] with Willis Krebs, Richard McCarthy and Manny Margolis, he and Martha Moxley commenced a sexual encounter at about 50 feet to the rear of the house, in the middle of the rear lawn, which concluded in mutual masturbation. Tommy estimates that the entire encounter lasted about twenty minutes. He last saw Martha hurrying across the rear lawn towards her home. 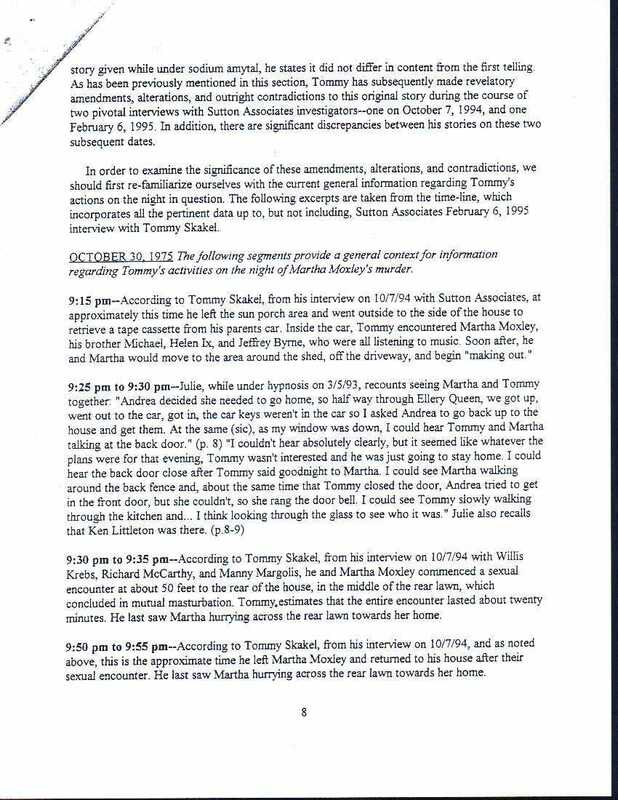 9:50 pm to 9:55 pm--According to Tommy Skakel, from his interview on 10/7/94, [footnote 1] and as noted above, this is approximately the time he left Martha Moxley and returned to his house after their sexual encounter. He last saw Martha hurrying across the rear lawn towards her home.